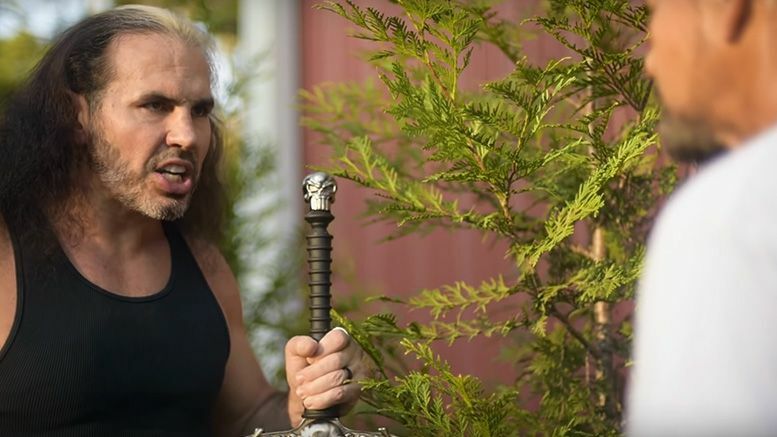 The Hardy Compound is being prepped for Halloween in the first teaser for their upcoming special … unfortunately, Woken Matt says dark forces are looking to ruin the fun. The footage begins with Señor Benjamin tending to the yard as Matt approaches dragging a sword on the ground. He then talks to Benjamin about the upcoming celebration in the Dome of Deletion, but notifies his groundskeeper that House Hardy is in jeopardy due to dark forces looming over. “Since the beginning of time, evil has tried to capture the magic of the Hardy compound and the nucleus of its magic — Excalibur,” Matt explains while stabbing the sword into the ground. This is followed by Woken Matt telling Benjamin to prepare the battlefield for MASSACRE! As we previously reported, the special is being produced by the team of people who worked on the original Broken Hardy segments in Impact Wrestling.